This event is focused on the reasons why the Energy East pipeline is not in the interest of people in Ontario. It will take place on Tue Apr 15, 2014, at 7 pm at the North Grenville Municipal Centre in Kemptville, Ontario. This is one of several events from the Council of Canadians and Sustainable North. 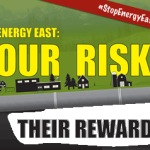 From April 7-16, they will be visiting communities across Ontario to talk about why TransCanada’s proposed Energy East pipeline is all risk and little reward. TransCanada’s Energy East project would be the largest oil pipeline in North America. It would ship 1.1 million barrels of oil every day through Ontario towards Saint John, New Brunswick. Join us to find out why this massive tar sands pipeline puts our water, land and air at risk. With information and video on the billion dollar tar sands spill in Kalamazoo, Michigan.